US stocks have fallen after President Donald Trump said his administration was considering leaving tariffs on China for a “substantial period”. Mr Trump said that a trade deal with Beijing was “coming along nicely”, but his comments dampened hopes a deal would be reached soon. US negotiators are due to visit China next week to resume talks. Wall Street baulked at Mr Trump’s comments, with the benchmark Dow Jones falling almost 1%. The Nasdaq and the S&P 500 also fell. 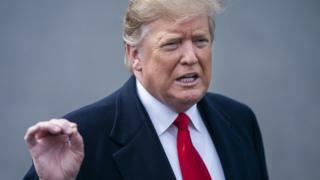 The US delayed the introduction of higher tariffs on $200bn worth of Chinese imports following three months of talks, after which Mr Trump said the nations were “very very close” to an agreement. The US had threatened to raise import duties on Chinese goods from 10% to 25% on 1 March. Following his remarks, the Dow Jones dropped by 0.73% to 5,698 points. The S&P 500 fells 0.57% to 2,816.5 and the Nasdaq slid 0.36% to 7,695.9. Mr Trump also said that the US was taking in “billions and billions” from tariffs. However, the most recent deficit figures showed that the US’s trade gap with the rest of the world jumped to a 10 year high of $621bn (£471.2m) in 2018.